Introduce your entire family to CASTLE IN THE SKY, featuring a timeless story of courage and friendship with stunning animation from acclaimed Academy-Award(R)-winning director Hayao Miyazaki (2002, Best Animated Feature, SPIRITED AWAY). Plus, this 2-Disc Special Edition DVD includes never-before-seen bonus features that transport you deeper into the film’s amazing world! This high-flying adventure begins when Pazu, an engineer’s apprentice, finds a young girl, Sheeta, floating down from the sky, wearing a glowing pendant. Together, they discover both are searching for a legendary floating castle, Laputa, and vow to unravel the mystery of the luminous crystal around Sheeta’s neck. Their quest won’t be easy, however. There are greedy air pirates, secret government agents and astounding obstacles to keep them from the truth — and from each other. 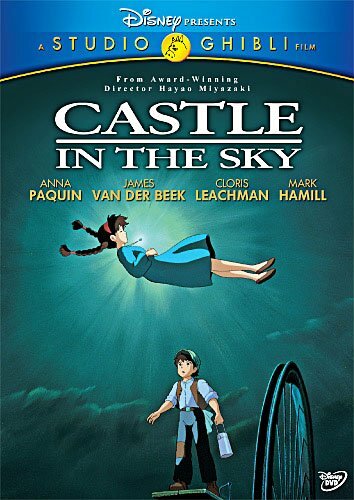 Add CASTLE IN THE SKY to you DVD library, and this magical and uplifting classic from Studio Ghibli and Disney will thrill and amaze your family for years to come.